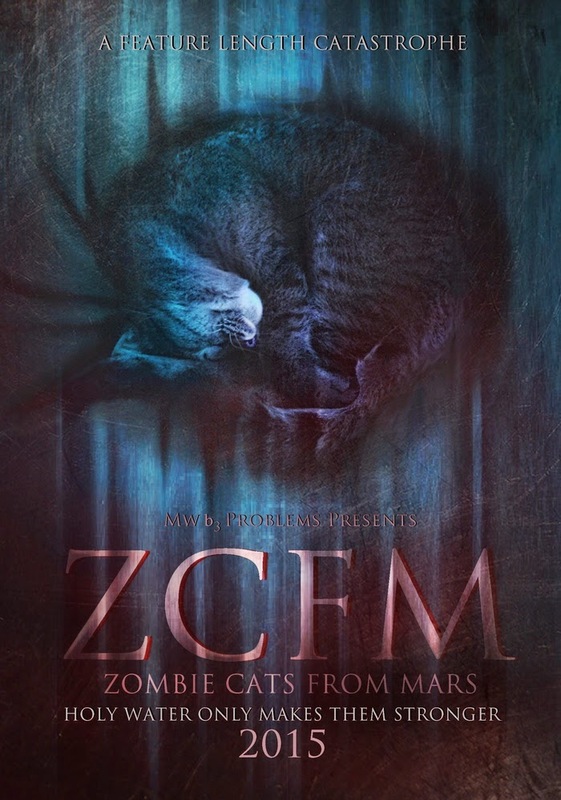 MWB3 Problems has laid out the galactic kitty-litter for its upcoming horror-comedy Zombie Cats from Mars. Directed by Montetré (Holed Up) and written by Ryan Cloutier, the ‘catastrophe’ – which came together thanks to a successful crowd-funding campaign on Kickstarter – is due for release early this year. The story centers on Billy, an effeminate fan of vintage science fiction action thrillers. His only friend is Cameron, a nerdy film buff who tries to boost his confidence whenever he can. After seeing a UFO land, Billy retreats into his head, imagining that aliens are taking over the town. Cameron is skeptical, as is the rest of the town. Meanwhile, people are starting to die. First, the reclusive cat lady, Percis, is discovered mutilated by Lester, the church‐going husband of Carolyn, Percis’s depressed caretaker. Random deaths soon follow, first a jogger, and then a janitor at the Carbonics Warehouse. A pair of news reporters share this information with the public while the Detective and his Chief try to solve the killings. Meanwhile, the killings continue. Billy, wrapped up in a world of fiction, discovers a story in which Martian Cats land on Earth and inflict horror upon the town. Confident that the killings are the result of the UFO delivering alien cats, he sets off on his own superhero mission to save the town. 1) The trailer seems to be everywhere this week, so I take it the movie is finished? Haha, I like hearing that the trailer is making a show of itself. Finished? Basically. It’s at that point where we’re adding the tiny little foley moments, making the zombie cat eyes look ultra cool and finalizing the color correction. Since that is basically completed, our focus has shifted primarily to the DVDs and Blurays. We’re making sure that all of the behind-the-scenes features look phenomenal. Our hope is that people will not only have a good time watching the film, but also learn about how we made a cat-movie. Maybe even learn a little about filmmaking. 2) The film will be available from the Kickstarter page itself, is that right? Yes! It is available there..meow! Excuse me, available now! And we ship them out in March! If we make the goal it means immediately sending those copies out to the backers, plus, awesome-sauce, setting up screenings in Portland, OR and Vancouver, WA. Our goal is to then take the film to other states and countries, either through festivals or independent theatres. We’re getting big in Australia, for some reason. I won’t complain! :) I’m just glad that we aren’t paying for shipping! 3) If the trailer is anything to go by, the movie seems to encompass a ‘Gremlins’ or ‘Critters’ vibe. Is it fair to say then that the movie is somewhat of an ‘80s throwback? Man...Gremlins and Critters….Zombie Cats from Mars definitely has that charm to it. It has a small amount of puppetry, an over-indulgence of animals, a “PG” feel and a satirical gesture to the underdeveloped, exposition-driven characters of 80’s Monster Movies. But...of course our film is, while inspired, its own unique creature-feature, one that I believe many of us who worked on it are very proud to put our name on. You’ll see. 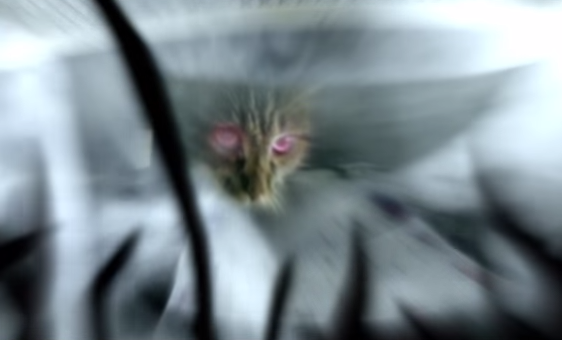 I’m mostly proud of the amount of long takes we were able to pull off, even while working with cats. 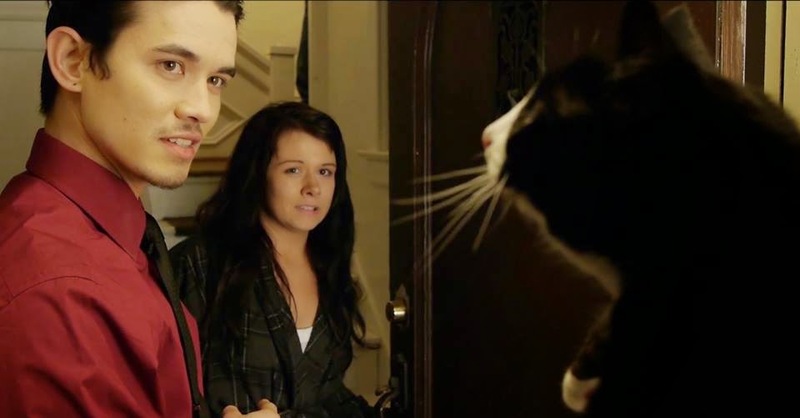 4) Did the cats behave on set? Any divas? They were good little kitties. I don’t want to bad mouth any one cat. That would be rude. Well, okay, fine, I will. Don’t tell them I told you. We had one fluffy, white cat, let’s call her Snowball, that was fired before ever finishing her first set-up!! We wasted 30 minutes and 15 takes to convince her to cat-act properly, but she was having none of it. Scary amounts of hissing and some deep scratches from Snowball on that 3rd night of shooting. Then there was the main tabby cat Germs, who decided to show up quite late on his first day. You can tell him I said that. He forced us to have to use a stunt-cat-double once. He did that twice, actually, not show up on time. What gives? Cats think they they rule the universe. Oh wait...that’s the premise to our film. Hmmm…..Niko was a fantastic little, black cat and our SFX Make-Up Artist Samantha Nylen actually adopted her. Not to say that the other cats were no fun. The gray tabby Ulyssess has a little bit of a temper and Big Boy, I’m not sure what he was...a calico? Well, Big Boy got both annoyed and hungry easily. Peggy Sue was finicky, just a little more than the lead cat Germs. Both Peggy Sue and Big Boy were adopted, too! I believe Peggy Sue changed her name in lieu of adoption. Something about wanting her name stricken from the credits. God...I’m talking about cats like I would talk about people. This does not bode well for my future. Here I come, here I come, the crazy-crazy--cat-man. 5) Do you yourself appear in the film? Haha, I do! My voice yells the question, “Are the injuries consistent with blunt force trauma, or more of a sharpened weapon?” or some phrase along those lines. It’s during a press conference that Mayor Hayes holds. I play the character named Blue Shirt.